Yay! I'm so pleased that this not so wee lady is now finally finished and I can properly introduce her to you all. I had hoped that she would have met you all a wee bit sooner but when planning my time scales I seemed to completely forget about the worst of all chores... finishing and weaving in loose ends of yarn, ugh! Of course the weather hasn't been the best here this week so blocking and drying took a few days too! Anyway, now she is here and might I say looking fabulous in her retro teal, orange, pink and cream combo! She's a great size too, about a metre in diameter, perfect for throwing on the floor when it's a bit chilly, or even snuggling up in you favourite chair with a nice hot cuppa and one or two chocolate biscuits! The best bit about having her finished and listed in my wee shop is that now I can start playing with some of the other ideas I've got swimming around my head. Maybe even a bit of winter knitting to boot! You've done a darned fine job here sweets! Oh, Emma! That is sooo pretty!!! 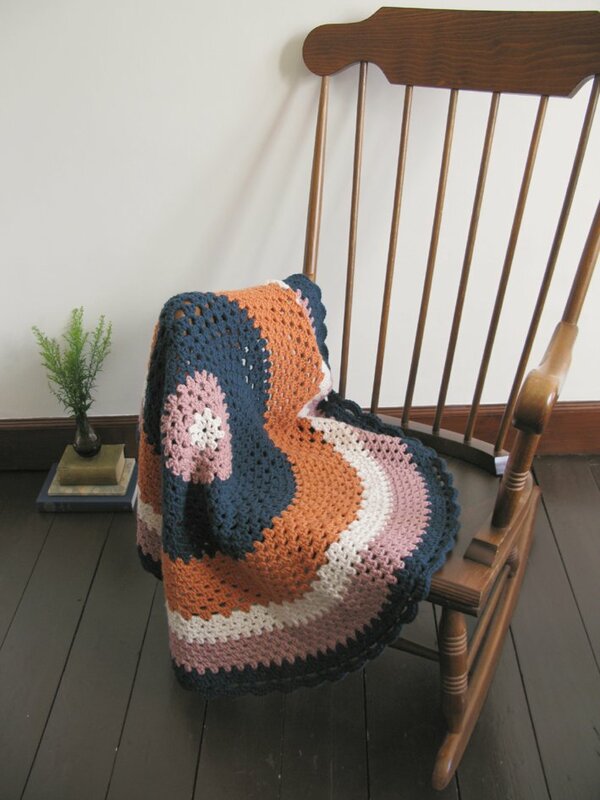 I love it as a rug :) You are the crocheted-home-furnishings-granny-chic queen! A true labour of love!! It's beautiful!!!! I really like the color combination in this rug. Almost too pretty for feet! I really love this combination of colors, and it looks great with the dark wood floor and rocker!